The Province of Ferrara is located in the north-eastern part of the Italian peninsula, in the north-eastern corner of the Region Emilia Romagna, along the axis Venice-Florence-Rome. Ferrara is 50 km from Bologna, the regional capital, and 60 km from the Adriatic Sea. Venice is 120 km to the North, while to the south the Province borders on the Province of Ravenna, which is 80 km from the centre of Ferrara. The northern boundary of the Province of Ferrara is marked by the bank of the Po River, beyond which there is the Province of Rovigo with the area of Polesine. The southern boundary is marked by the River Reno, running through the territories of Bologna and Ravenna. The Province of Ferrara is located in a flat area that covers 25% of the level ground of the whole Region. Therefore, the area of Ferrara has always been characterised by the balance of land and water. Part of the area was reclaimed from sea and brackish water. Agriculture has always been the main activity of the Province of Ferrara. Modernisation has reached the Province only partially: it never experienced a massive industrialization process, although there are some excellent industrial examples in the area (VM motors, Berco, ...). 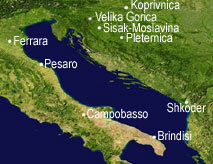 The 350.000 inhabitants of the Province live mainly in the city area and along the coast, as well as in the areas of the towns of Cento and Argenta. In 1995 Ferrara was inscribed in the UNESCO List of World Heritage Properties as admirable example of Renaissance City, unique for the integral conservation of its historic centre. In the following years the area of the Po Delta Park was also acknowledged World Heritage Property. The Park covers 60,000 hectares stretching between the Provinces of Ferrara and Ravenna and is coordinated by the Municipalities and the Consortium created for the management of the Delta area. The whole area is covered by a network of cycling routes, connecting the western corner of the provincial territory with the eastern end of the delta area. The Municipalities are currently working on projects for the creation of river routes. Some have already been completed: the recovered docks in the city connect Ferrara with the River Po and the Adriatic Sea. The Province of Ferrara comprises 26 Municipalities, which host about 35,000 enterprises. Agriculture employs 8% of the labour force (twice the national average). The agricultural share of the provincial GDP ranks second in the north-eastern part of the country. The industrial sector employs 35% of the population, 14% of the added value produced by the whole sector is generated by the artisan sector. The service sector employs 57% of the working population. The unemployment rate is 4%, about half of the national rate and the income per capita, with 17,000 euros, is above the National average of about 15,000 euros. Recently, the Province has committed itself to research in the field of new technologies and services. The city now hosts a cluster of technological research, which is the incubator for the development of innovative enterprises within the regional network of industrial research. The University of Ferrara has 8 faculties, both in the scientific (medicine, engineering, economy, etc) and humanistic areas (letters, philosophy, law, etc), attended by about 15,000 students. Exchange of experiences, good practices and pilot actions in the field of planning and managing water resources in catchments basins, coastal areas and lagoons on the shores of the Adriatic Sea. Main actions: a software for the implementation of the hydraulic and quality mathematical model; a chapter on the analysis of different possible scenarios through the model mentioned before, in the draft discussion paper of the Provincial Plan for the Protection of Waterways, which will be circulated among citizens, institutions and environmental associations during the participation phase envisaged for the approval of the Plan; a chapter on the analysis of possible scenarios through the model mentioned before in the final draft of the Provincial Plan for the Protection of Waterways; a dedicated section to the argument on the Web site of the Province of Ferrara; dissemination of the results of the use of the model mentioned before during the participation phase envisaged for the approval of the Plan.